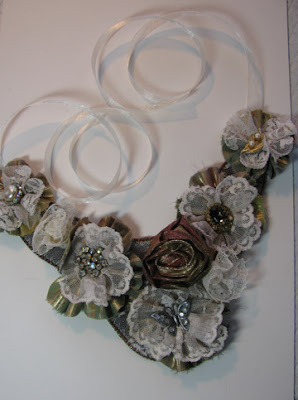 Stitch the flowers into place on the necklace background, using the tails left from flower construction. 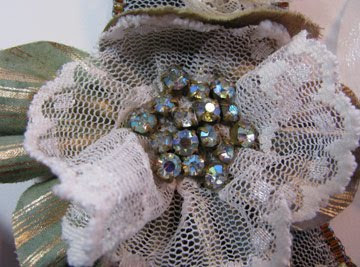 Stitch the rhinestone jewelry bits into place on each flower. Stitch the rolled rose flower into place. 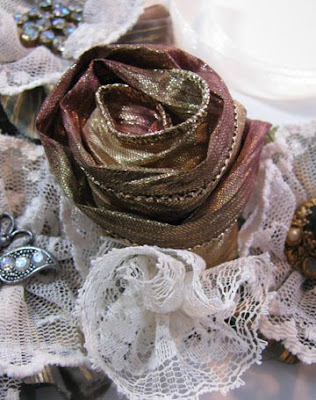 Make an add a few smaller lace rolled roses. Each used 18 inches of lace. Cut a backing piece of ultrasuede the same shape as the top. 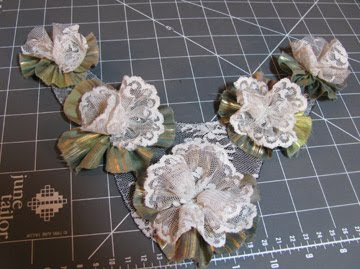 Lightly glue it into place, adding ribbons at the top of each side (stitch these into place as well as gluing them). Use only enough glue to keep the pieces lined up. 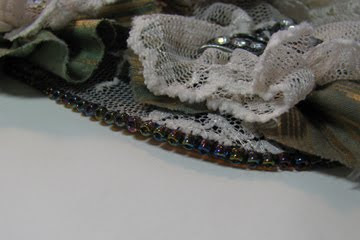 Add a row of edging brick stitch through all layers to cover the raw edges with size 8/0 beads. Here's what the back will look like. 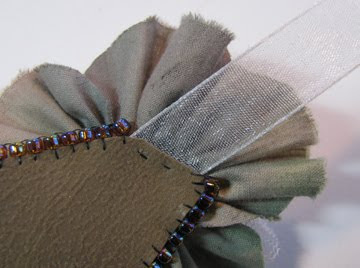 The two little stitches you see through the ribbon are not the only thing holding it in place. It is stitched invisibly to the inside of the necklace too. Ready to have the ribbons finished off. The fabric you chose for the rolled rose is just perfect. Is it lamé? Yes! Wide wired lamé...a deep gold that tones into mauve. I *love* it!